Supporting data for "Draft genome of the honey bee ectoparasitic mite, Tropilaelaps mercedesae, is shaped by the parasitic life history"
The number of managed honey bee colonies has considerably decreased in many developed countries in recent years and ectoparasitic mites are considered as major threats to honey bee colonies and health. However, their general biology remains poorly understood. We sequenced the genome of Tropilaelaps mercedesae, the prevalent ectoparasitic mite infesting honey bees in Asia and predicted 15,190 protein-coding genes which were well supported by the mite transcriptomes and proteomic data. 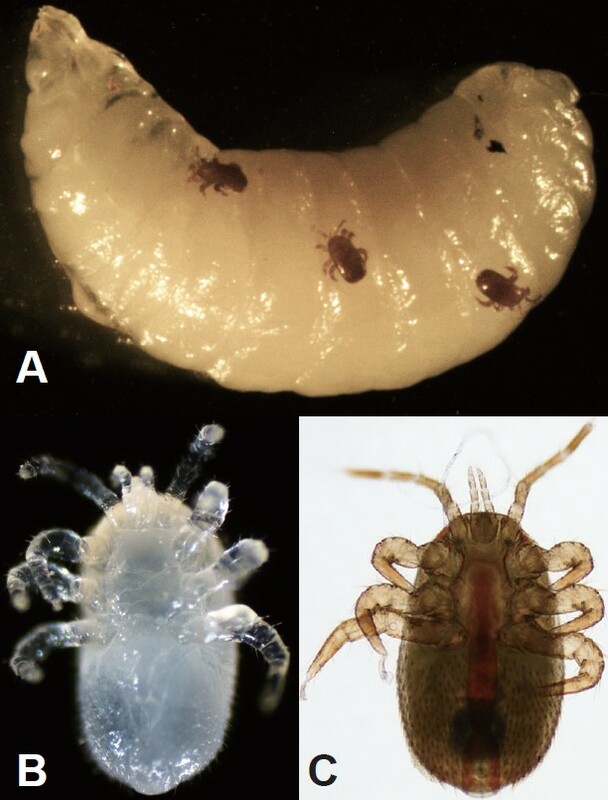 Although amino acid substitutions have been accelerated within the conserved core genes of two mites, T. mercedesae and Metaseiulus occidentalis, T. mercedesae has undergone the least gene family expansion and contraction between the seven arthropods we tested. The number of sensory system genes has been dramatically reduced but T. mercedesae contains all gene sets required to detoxify xenobiotics. T. mercedesae is closely associated with a symbiotic bacterium (Rickettsiella grylli-like) and DWV, the most prevalent honey bee virus. T. mercedesae has a very specialized life history and habitat as the ectoparasitic mite strictly depends on the honey bee inside a stable colony. Thus, comparison of the genome and transcriptome sequences with those of a tick and free-living mites has revealed the specific features of the genome shaped by interaction with the honey bee and colony environment. Genome and transcriptome sequences of T. mercedesae, as well as Varroa destructor (another globally prevalent ectoparasitic mite of honey bee), not only provide insights into the mite biology, but may also help to develop measures to control the most serious pests of the honey bee. ... Description:One adult male Tropilaelaps mercedesae was sampled in a honey bee colony purchased from an apiary in Jiangsu Province, China in October 2013, and stored in acetone at 4°C until use. Displaying 1-10 of 10 Sample(s). Displaying 1-10 of 73 File(s).